The Karcher K2 Compact Home and Car Pressure Washer is ideal for maximum power with minimum fuss. Lightweight and compact, the Karcher K2 can be stored away easily with its neat, upright design and the on-board storage solution will keep all your Karcher accessories together by storing them on the machine itself. The machine has been ergonomically designed with you in mind and its lightweight body and useful handle make carrying the washer around the home and garden easy for anyone. It can be used to clean cars, caravans, bicycles, garden furniture and patios and the additional accessories means you can tailor the machine to your needs. Although small enough to store away and transport around the home and garden, the powerful 1400W motor gives a flow rate of up to 360 litres per hour and a maximum pressure of 110 bar (11 MPa) meaning what the Karcher K2 Compact lacks in size, it certainly does not lack in performance. As standard, the pressure washer comes with a trigger gun, 5m high pressure hose, one-way lance, detergent suction facility and a Dirtblaster Lance which provides up to 50% greater cleaning power than a standard high pressure lance. 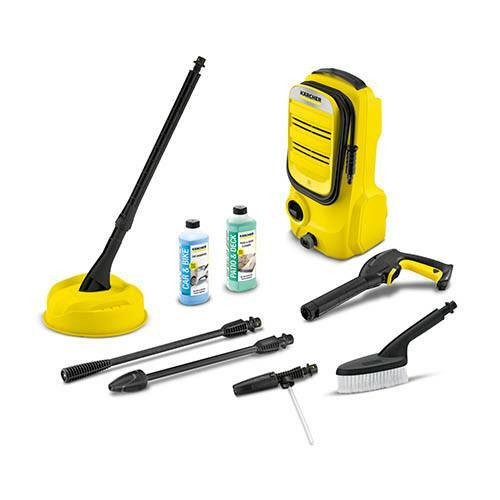 Also included with this Karcher K2 model is a Home & Car Kit containing everything you need to transform your home and car. You’ll get a T150 patio cleaner and detergent which provides fast and convenient, splash-free cleaning of large surfaces including decking and a wash brush, foamer and shampoo for spotless cleaning of the car, caravan, motorbike or bicycle. The Karcher K2 Compact Home and Car features an impact-resistant, recyclable plastic casing that effectively prevents dirt particles from damaging the motor and pump and a safety valve prevents pressure overload. A pressure switch control switches the motor on and off when the trigger gun is pressed and released. The detergent injector system will supply detergent to the area being cleaned without you having to lift a finger.